So far throughout my time with Final Fantasy X I have been delightfully surprised for a most part. A few gripes here and there, but mostly it’s pretty solid. That trend continues this week. I honestly don’t have a lot to say – just one new annoyance and one slightly interesting realization. The frustration I have encountered has to do with losing battles and getting a Game Over. Look, sometimes you’re going to encounter an unexpectedly powerful enemy or think yourself stronger than you are in a moment of cockiness. These things happen, and there’s nothing to be done about it but start again and learn from your mistakes. 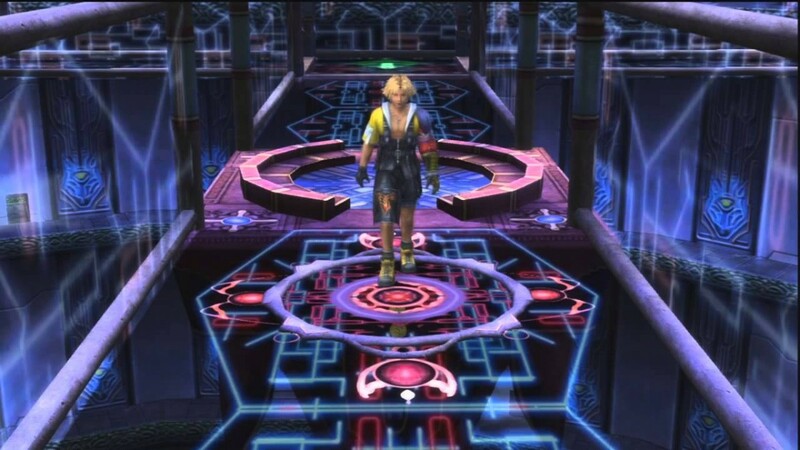 My problem is that Final Fantasy X has this really awesome mechanic (and his name is Cid, hurr) where you can swap out party members as often as you please throughout a battle. Got your heavy hitters of Wakka, Auron and Kimahri out but you come across an enemy that’s weak against fire? Swap out Auron for Lulu. Want to steal their goodies? Trade Wakka for Rikku. Need someone healed? Pull out Yuna in Kimahri’s place. This is so incredibly helpful; by far one of the best pieces of game design present in FFX. The fatal flaw is that if one of your three party members dies, they cannot be swapped out unless you revive them first. Now say what you will, but I think it’s in pretty poor taste for my friends and allies to just sit idly by on the sidelines as the rest of my team gets thrashed. Perhaps the game would be too easy if your slain party members automatically swapped out for those in reserves, but it just doesn’t make sense to me that you’ve got seven able-bodied fighters on your team, yet only three need die before that terrible Game Over screen looms overhead. In other games like Final Fantasy VII or Final Fantasy VIII, your other party members are often broken into separate groups, travelling on their own to the new destination unless you call upon them. It kind of makes sense that they wouldn’t necessarily be around to pick you back up when you fall. 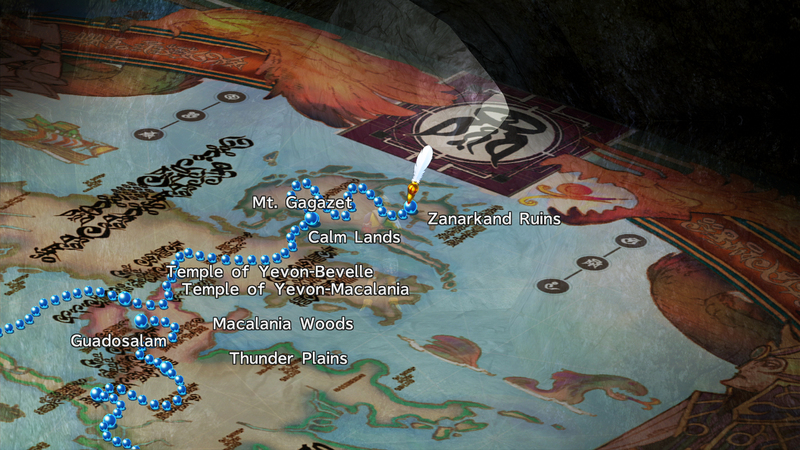 But the team in Final Fantasy X is making the pilgrimage together. If someone’s pulled away or separated for any reason, you straight-up can’t have them in your party. But if you’ve got more than three teammates together, you should definitely have the option for one of them off-screen to replace a fallen comrade. Now like I said before, I had a sudden lightbulb-on moment of realization this week as I traveled from Macalania to Bikanel to Bevelle and back to Macalania. 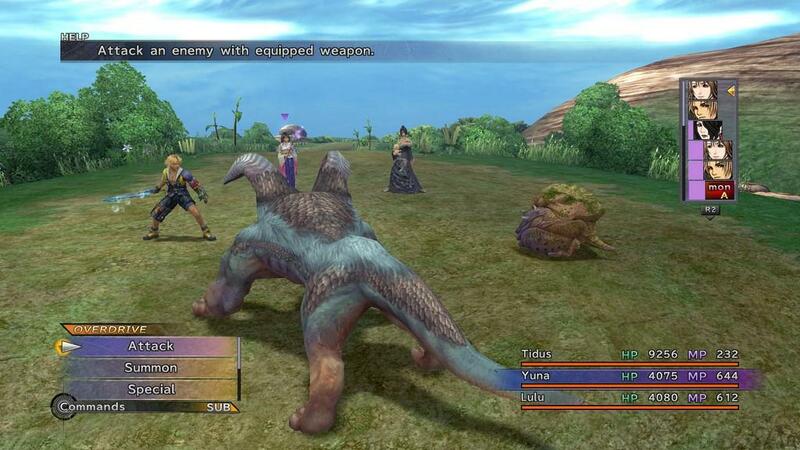 Final Fantasy X is very nearly as linear as Final Fantasy XIII, yet for some reason FFX has been widely heralded as a fan favorite while FFXIII’s linearity is a prime point of contention among its vocal crowd of haters. I have heard so many complaints about how FFXIII lacks typical Final Fantasy conventions like a world map and an airship that allows you easy travel between all the towns you’ve been to, as well as shops and NPCs to interact with in said towns. And yet, FFX is very much the same. I’m not sure what’s yet to come, so maybe I’ll be eating my words come next week, but so far I’ve made my way from one location to the next, fighting enemies on my way from point A to point B with plenty of constant plot progression. Oh, and the only airship I’ve been in was non-controllable, so if I want to return to a previous location I’ve got to walk and battle my way there. There are several differences between the two games, like FFX has a slew of mini-games and side quests that you can have fun with throughout the game where FFXIII lacks quite a bit, but it’s still an incredibly linear game. Either the people who criticized Final Fantasy XIII for its linear nature should lighten up, of they should hold Final Fantasy X equally accountable. Oh! I just remembered one more thing I wanted to have a moan about! The awful temple puzzles! They’re so dumb! While playing through them my wife commented on how nice a change of pace they must be, as there are no random battles to distract or prolong the puzzle solving. She’s not wrong; having to fight a battle every three steps while trying to wrap my head around which spheres go where was definitely a plus, but when push comes to shove I feel like the temples themselves could have been much better. Most of the puzzles are simply boring and uninspired, but the Bevelle Temple – the one with the moving platforms, for those familiar with the game – was downright infuriating. I’m not saying I didn’t like it because the puzzles were too difficult to solve. I got stuck here and there, but worked it out in the end. The problem was trying to time the selection properly when the arrows on the ground are pointing the right way. You can’t slow down your platform or speed up the arrows, so if you launched the platform at the wrong time you completely miss the window to go where you want to go, fall over the edge, and try again. I hate, hate, hated that temple. So dumb. Anyway, that’s where I’m at now. My next destination is Mt. Gagazet, and my wife (who’s been following my progress with a walkthrough) tells me I’m not far from the end of the game. If all goes according to plan I should be able to wrap it up this weekend, then begin my first MMORPG next week with Final Fantasy XI. I’ll be on the lookout in the coming days for teammates to join me while I play for a few weeks, so hit me up on Twitter (@zacharyplyons) if you’re interested in partying up! Always remember too, you can follow my daily adventures with the marathon at the hashtag #RoadtoXVin15! < The Save/Continue Podcast: Episode 2: Indies, indies, and indies!